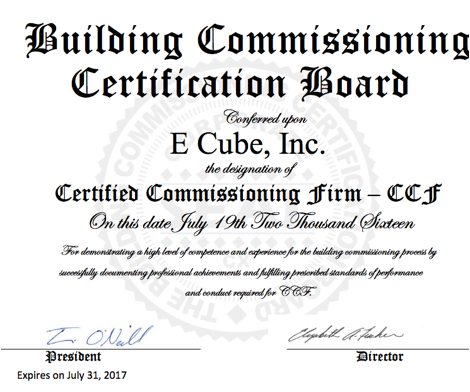 The Building Commissioning Certification Board (BCCB) recently announced that E Cube, Inc. has been awarded the Certified Commissioning Firm (CCF) designation, having met all of the necessary requirements for the CCF, a portion of which includes extensive qualifying experience. The firm’s work on Primary Children’s Medical Center Ambulatory Care Center and Stanford University’s Research Animal Facility among others, helped E Cube earn this prestigious designation. The BCCB was formed in 2004 to recognize firms who satisfy high-caliber commissioning requirements. Establish nationally recognized standards of knowledge and experience for building commissioning firms. Recognize firms who meet the requirements set by the BCCB. Serve building owners and the public by encouraging high quality building commissioning services.